I don’t recognise the first memorial, but the second after a minute or so is certainly the memorial south of Hania on the Omalos road at the Alikiarnos junction. This is a memorial to those dead in the last war when the Germans occupied Crete. There is listed the names of those killed in around five local villages. In the basement of this memorial is a glass ossuary containing many skulls of those killed, each with a bullethole over the right ear. Later in this movie I see the hospital in Rethymnon which was newly built in those days. 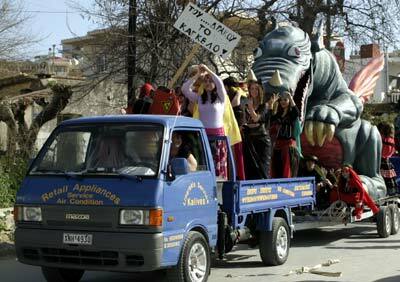 The big ceremony/festival near the end of the movie is certainly in Eleftheriou Square (Freedom Square) in Iraklion. That’s the one with all the crowds and marching soldiers. If you watch carefully you will see the Iraklion Morosini Fountain twice. Here is part 2 of 2 of this film. The first part of this film is obviously a trip eastwards from Iraklion towards Agios Nicholas. The first part of the film is a stop at St Georges church in the gorge of Selinari near the village of Vrahassi. I remember this place on the first bus I took when I arrived in Crete going to Agios Nicholas. 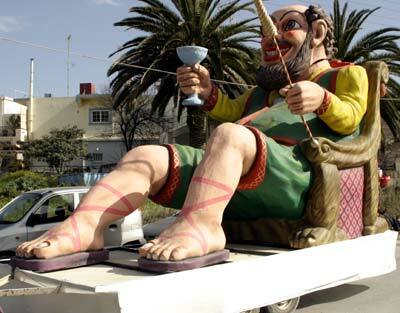 No Cretan can pass this shrine without stopping. The whole busload got out and said a quiet prayer here. Most of the rest of the film is taken in Agios Nicholas – you can clearly see the small lake with the boats that connects to the sea. The final part of the film is I feel taken on a trip to the Lassiti Plateau – you can see the windpumps/windmills. If any of you out there can do better than me and identify more of the places in the film, of which there may be several, then I and John would be grateful. Please post a comment. I would appreciate it and so would John Sooklaris. In memory of his father who took these great films. This is another of Anthony Sooklaris’s movies published by his son John Sooklaris. I think that John is a little confused about the whereabouts of this movie but I see it clearly as at the monastery Agia Triada, the monastery of the Holy Trinity in Akrotiri. 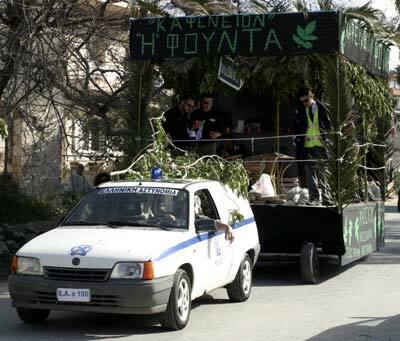 I don’t know if the day was a special celebration or just a welcome for the Cretan Americans but it all happened in 1961. This video takes place in what appears to be Chordaki Akrotiri Crete Greece, and then moves on to Sternes at the home of Kosta Verganelakis. Early on the video, I believe I recognized Themistocle Tsouchlarakis as well as Antoni Panagirakis who is the dancing Chorofilaka. Beyond these few faces, I don’t know anyone else in the video. I would love to hear your comments and hear from you if you recognize anyone, the villages, the reason for the get-together, and anything else that you would like to share. The word lyratzida means violinist. I hope that you enjoy this unique movie. This next video is taken in Iraklion in 1961. It has been posted by John Sooklaris but the man behind the camera is his father Anthony Sooklaris. They visited Crete on a ship sponsored by the Pancretan Society of America in 1961. This film shows Iraklion very well. You clearly see the old market in Iraklion with all the butchers and fruit and cheese shops unlike now when it is mostly tourist shops. You then have some clear shots of Eleftheriou Square (Freedom Square where I used to work in 1968 on) and the Morosini fountain. In the closing shots of the film you see a man walking across the road. This is the later very famous musician Nikos Xylouris the great singer of Crete. Here are Johns words about the movie: “O Pramateftis. While this video clip is more the life and times of Heraklion, Crete, in 1961, it does tell a story that Mountaki so eloquently tells in this story of the poor peddler. You will see peddlers selling their wares at or near the Agora. I just love the shot of the traffic cop. Anthony Sooklaris so keenly captures the moment in this amazing footage of what life was like. Make sure to catch the traffic cop. It’s a classic solution to a then “new” problem of how to deal with more cars on streets that were once more populated by horses and donkeys, than by motor vehicles. Enjoy, but see also how much this island has changed in 47 years. In 1961 a cruise ship called the Queen Frederica set out from the United States to visit Crete. On board were a large number of American Cretans coming to see again – or see for the first time, perhaps, their homeland. Luckily, one man had what we used to call a Super 8 movie camera. The kind that takes 8mm wide film that you have to have developed professionally. He took some film of the trip and what they saw and where they went in Crete. These old movies, amateur movies but well filmed have now been converted by a man called John Sooklaris in America, and submitted via Youtube for me to display here on my Cretan website. John, thanks for doing this, these films are quite unique and priceless. The first movie that I am putting on here is of the city of Hania and around in 1961. This was five years before I came to Crete over forty years ago. The film is wonderful, it shows the squares and the Agora and some of the beach between the city and the Akrotiri peninsular. It is ten minutes long. Remember that in 1961, Hania was the capital of Crete. It was changed to Iraklion in 1975. So here is the movie in the days before tourism. I hope that you enjoyed it and I will be posting more of this 1961 trip very soon. I really love this clip from Zorba the Greek. It is the final moments in the film following the enormous disaster that Zorba caused running logs from the monastery on top of the hill down to the sea. The clip is taken on Stavros bay in the Akrotiri peninsular. Anthony Quinn is Zorba and Alan Bates is the English guy. Nice stuff, I hope you enjoyed it. I wrote an article a while ago called Romiosini, the soul of Greece and I don’t know how many of you read that article. But it was for real. I spent some time back in the sixties and seventies working on what I had discovered as the soul of Greece. For English people coming to live here I felt that it was an idea that they should understand. And I feel that you should try to make an effort to understand this. To help, I have added this fragment. Tomorrow is clean Monday, the first day of Lent and the day that all Greeks go and fly a kite on the beach or a high hill. But today, today was Carnival Day. 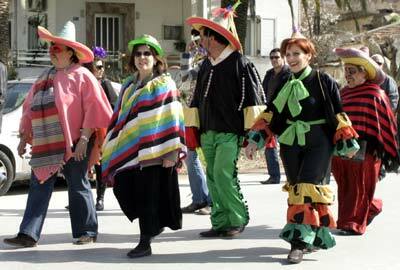 Here are some pictures of our local carnival in the town of Kalives, Hania. These are a few of the well dressed locals walking through the village. 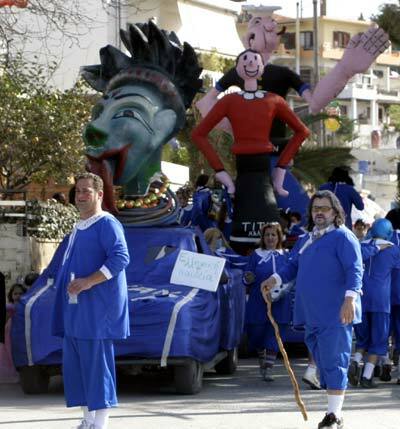 Now the floats start to go by – headed, of course, by the god Dionysus. 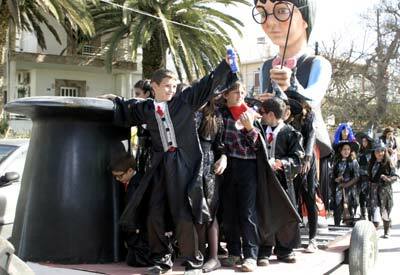 And of course Harry Potter seems to be taking over the world. I do love this beautiful dragon. 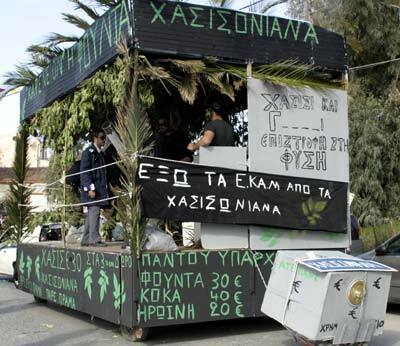 This is the float for the local football team, the Titans. Perhaps I shouldn’t say too much, but you may remember the recent police raids on the village of Zoniana. This float represents that and you will see . . .
. . . from the writing on the float some of the dubious benefits of that place. The little trailer at the back is of course the safe that was stolen from the local bank and allegedly found somewhere else. So let us end there with our beautiful dancing girls . . . whoopa! !